In less than 4 months, MinnesotaBreweries.com has posted over 1,000 beer events around the state of Minnesota! Without a doubt, we offer the most complete and largest calendar of beer loving events across the state of Minnesota. Of those events, one of the most common categories are charity events. It’s awesome to see so many breweries and bars raising money for great causes in our communities. Drinking beer is great, but it’s even better when you can do it for a great reason and give back at the same time. Beer releases and tap takeovers are common occurrences on the calendar also. We’re all down for trying new beers and the brewers across our state are constantly coming up with awesome new beers to help quench our thirst. Beer dinners aren’t nearly as common as they may have been some years back. It seems the costs of most continue to rise. Some years ago, a beer dinner with 5 courses and 5 beer pairings could be found for $45 or less. Now it seems you rarely see one under $60 and those costing nearly $100 aren’t uncommon. It seems many spots may be pricing themselves out of the market when it comes to this combo, which is sad because it’s always an amazing opportunity to enjoy great food and beer together. Let’s hope some start seeing the benefit in keeping prices under control and offering a beer dinner everyone can afford to enjoy. Going forward, we’ll continue to keep the calendar filled with beer-filled fun. 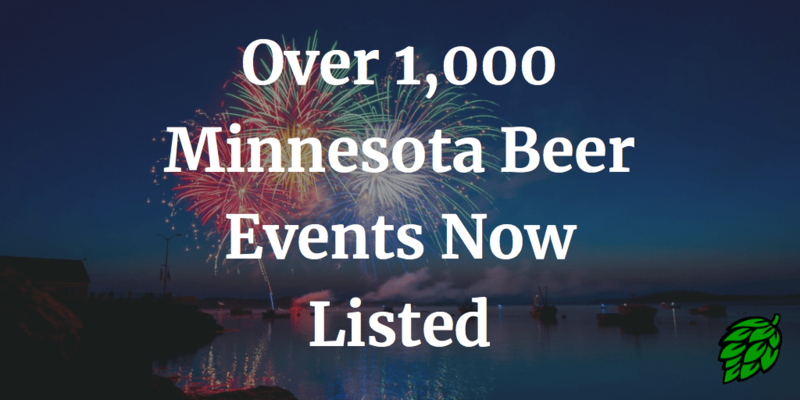 Be sure to check back frequently, as we add at least 5-10 local Minnesota beer events to the Minnesota Beer Event calendar every single day. We’ll see you out there drinking!